Wednesday, no ordinary hump day! Well, this was no ordinary Wednesday. We'd got up at 5:30am for a run (like I said "relaxing"), clocked a relatively slow 5km, I blame it on being half asleep. Next up, 20 mins of profuse sweating as I acclimatise to the 20°C heat at 6:15am, followed by a cold shower, more sweating, breakfast, coffee, a gallon of water, and finally a little more sweating! Work commenced as normal, and I ended up finishing with the obligatory headache. 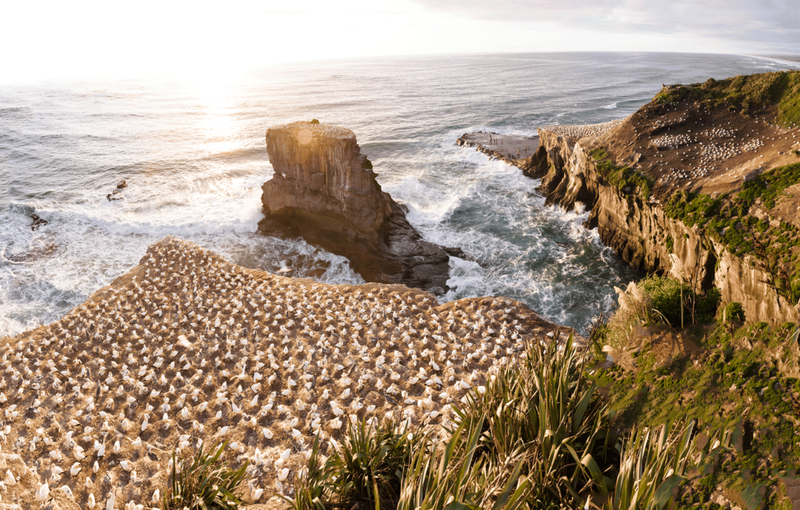 For weeks, I'd wanted to get out to Muriwai, to photograph the sunset and the Gannet colony, before the nesting birds disappeared, and we left for Australia. My wife got home at the usual time, and because our body clocks had been turned upside down, and we weren't doing a run in the evening, we found that we'd cooked and eaten by 5:30pm. We both looked blankly at each other, what do we do now? Shrug! "I suppose we could watch TV?" Nope! We quickly threw together a bag, mostly weighed down with camera kit, a makeshift tripod (camping chair) and some water. After a 40 min drive, we set out on the 2km walk. First we hopped our way down some stairs, walked through some dense bush, and reached a lookout to grab some panoramic shots, but the sun was still too high, and bleached most of the images out. Oh well, we carried on walking, and got to a fairly steep section. Temperatures at 7pm were still about 24°C, so I guess I should start sweating profusely again? We finished the walk, hopped into the car, cranked on some summer tunes, blasted ourselves with the AC, and headed down towards the beach. Stopping at a couple vantage points to grab more shots. We got to the Gannet colony at the perfect time, to find them shrouded in this golden light, it was amazing, I could have spent hours there. We quickly moved down to the beach to capture the last of the sunset. 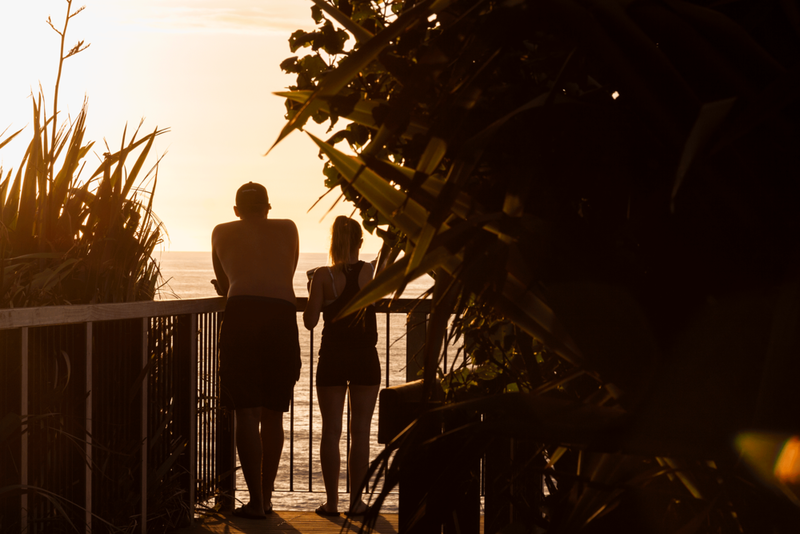 I seriously cannot recommend this enough, I can't think of a better way to relax, all I needed was the roar of waves, catching a few hundred photos, a brisk walk, the beach and a warm summer evening with my wife. If you've had a hard day, you'd be almost guaranteed to forget about it. If I could bottle the day up, without the sweat and the faint smell of Gannet deification in the air, that would be awesome! I hope you enjoyed the read, what tips/stories do you have for staying relaxed? PS Enjoy the gallery below! Trying to capture a few birds flying over, this was the result. Watching the fishermen and women getting pounded by the waves. Getting better, that sun is still causing problems. Being a Gannet looks quite relaxing! I caught these two have a disagreement, but I think the one at the back, stole the show, "Did he just say that?" Heading back in for the night. I love the colours here, it just sums up the night and what it looked like.